The months of November and December has been remarkable for Findworka and to other Nigerian startup companies whose founders were part of the Enpact Fellowship as one of the assigned mentors, Moses Acquah, an experienced CTO, a senior ICT Company Builder, certified scrum master and coach visited start-ups across the country to inspire them, reports ITRealms. As part of mentoring the fellows at Enpact, he visited Findworka’s office at Yaba, Lagos where he shared amazing tips with the Findworka Team. He studied all aspect of their operations and offered advice to the marketing, customer service and design teams. Dele Bakare, his enpact-mentee and the chief executive officer of Findworka recalls the visit as a highly insightful experience. Moses urged the team to use the S.A.R.A principle to access the quality of every idea- every product must be sustainable, affordable, reliable and accessible. He also interacted with Findworka’s engineering team and shared his thoughts with them on how to make better products for their clients while improving on the production time and he advised operations on how to manage burn rate. Finally Moses Acquah discussed Findworka’s latest project, a developer-focused hackathon called Saucecode a developer-focused competition. The competition’s website is live athttp://saucecode.xyz and the call for entries has already begun. To participate, you must join or form a team of a maximum of four people and a minimum of 2. Participants are required to build a solution for one of problem statements listed on the website. Afrolynk’s conference 2018 and coaching for the winning team to prepare their application for the Afrolynk’s $50,000 startup challenge. Saucecode is a project aimed at discovering and celebrating the finest technical talents in Africa starting with Nigeria. It was conceived to challenge the developers in our ecosystem, encourage programming best practice, promote collaboration, make new role models out of the very best and put Nigeria on the map again. 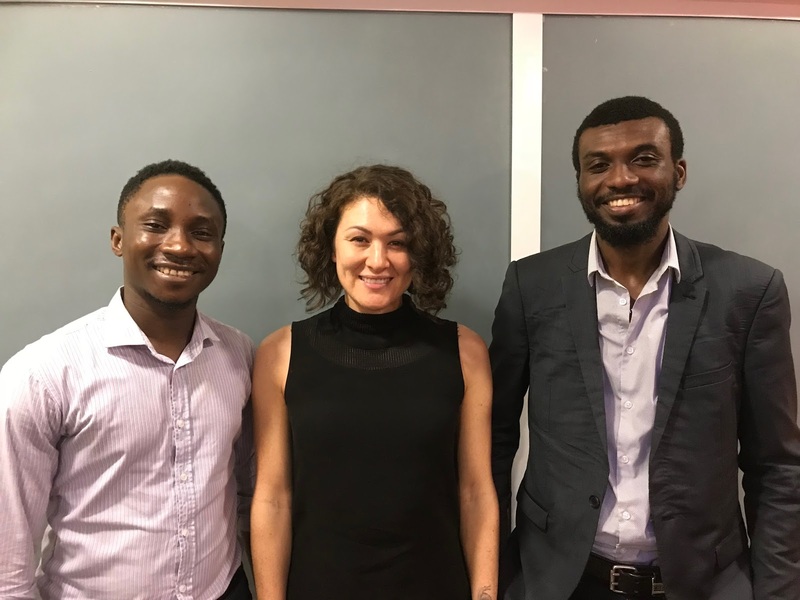 Findworka and two other nigerian startups will be heading to Ghana this January for the final one week intensive startup mentoring camp (enpact mentoring.org) which will be crowned with an Afrolynk - Enpact Startup summit in Accra. All Enpact Nigerian startups together with other startups across West Africa will meet and interact with seasoned Mentors, Experts and investors within African and from Europe. Pix: L-R Dele Bakare CEO, Findworka, Songya Kessler ( ​Leadership Consultant and mentor, Enpact.org, and Moses Acquah, CTO/ Snr ICT Company builder at GreenTec Capital Partners.